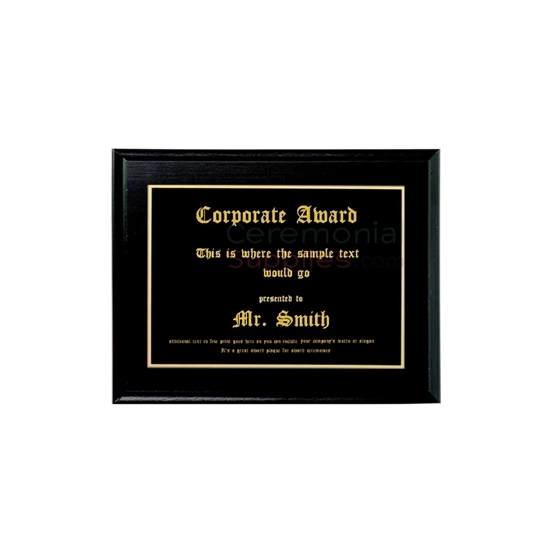 An excellent award gift for corporate recognition that is straight to the point, this is a horizontally oriented plaque measuring 10 X 8 inches. The plate is of a black gilded variety and can be personalized with up to 13 lines of engraved text--each up to 35 characters in each line, including spaces. Providing you with yet another way to commemorate exceptional performers, the 10 x 8 Black Recognition Plaque will prove to be a formidable piece in your arsenal of corporate awards to recognize your valued members. With its high gloss black plate and ornate engraving, the plaque will impart a decorative aura sure to elevate the status of any mantle you put it on to display your successes.